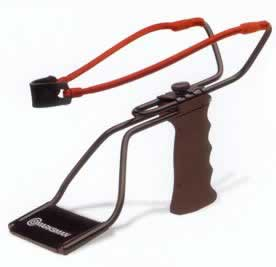 State laws prohibit us from shipping or selling slingshots to residents of Massachusetts and New Jersey. Fully adjustable tempered steel yoke. Highest quality tubular thrust bands. Black high impact plastic finger groove handle with arm support for maximum comfort and shooting stability. Will shoot 1/4 inch and 3/8 inch steel shot.